Samsung Electronics is looking to allow viewers at home to feel in real time as if they are at the PyeongChang 2018 Olympics through virtual reality headsets. 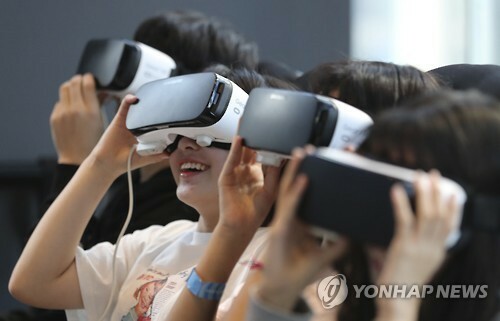 “We plan to offer virtual technology so that, let’s say, viewers with a VR headset in Seoul can enjoy the sports game as if they are at the scene,” Samsung Electronics Mobile Marketing Director Cha Young-tae told The Korea Herald following a meeting with the ICT Ministry on Tuesday. “We are in discussion with the International Olympic Committee and Olympic Broadcasting Services to utilize our VR technology during the Olympics,” Cha said at the meeting attended by the ICT vice minister and Korean tech firms including Samsung, LG, SKT and KT. This will not be the first time that Samsung offers VR headsets to enable viewers to watch a game or concert through a 360-degree video. The company provided a similar service for the Rio 2016 Olympics, enabling VR headset users to view exclusive coverage of sports. However, an upcoming first at PyeongChang might be real-time VR coverage, with the realization of the 5G network for the first time in the world. Samsung also plans to set up some promotional centers in Seoul where it will offer the entertainment rides it unveiled during the Mobile World Congress. At the MWC in February in Spain, the Korean tech giant drew attention with its diverse VR entertainment rides. Lee declined to elaborate on further details as discussions are still ongoing and nothing has been confirmed. KT, an official sponsor for next year’s PyeongChang Winter Olympics, is spurring efforts to realize the world’s first 5G network for the big event in 2018.